These heavy-duty evidence bags from Lightning Powder make it easy to store and label the items that you find at a crime or accident scene. 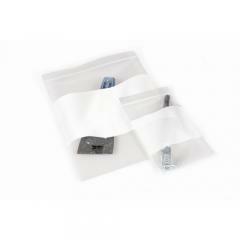 Their self-closing zip-lock fasteners seal the bags securely to keep the contents in and contaminants out, while still allowing quick access when required. They can be reclosed over and over again for reusability. The clear material allows you to see what is inside without opening the bag, and each one features a large blank white space for recording case numbers, times, dates and names as needed. Each pack contains 100 bags, and four different sizes are available.